Stop what you are doing and get this book. I LOVED this book. I am a huge Jodi Picoult fan, and if you weren’t aware I am obsessed with elephants. So this was meant to be a good book for me. Picoult told this story from four different points of view: Jenna, Serenity, Virgil, and Alice. Alice is Jenna’s mother. She went missing when Jenna was three, so Jenna has been searching for clues for the past 10 years to find her. Now thirteen, she enlists the help of Serenity, a psychic, and Virgil, a PI. When you are reading Alice’s perspective you actually go back in time before the disappearance to give you some context. I thought the way she laid out the book was brilliant. I was never confused on who was talking since each chapter was a different character. I also felt having the four different perspectives showed you different sides of the same story which brought depth to the plot line. I am not going to tell you more to the story because I don’t want to give anything away. I want you to experience all the emotions I did with every twist and surprise. This is honestly one of the best books I have read in a long time. Seriously it is possibly now in my top five all time favorite books is how much I loved it. Not only is it a story about human emotions and how intertwined and messy but beautiful they can be, it also talks A LOT about elephants. I would call myself a novice expert (if that is a thing) on elephants. Every research paper in elementary school up to high school I did on elephants. I had all kinds of elephant encyclopedias/magazines growing up, and give me all the elephant figurines at the dollar store please. One of my dreams growing up was to work with elephants at a zoo or sanctuary. How I found this book was because I was setting up my yearly donation to the Elephant Sanctuary in Tennessee. (Click here if you want more information on that or to read about the lady elephants there.) Anyway, so I know when a writer is speaking the truth on elephants. She wrote so beautifully on the emotional capacity of these wonderful animals, and the way it fit into the story was just great. I thought the flashbacks from Alice were a nice touch, and I honestly didn’t see the story unfolding as it did. And I am usually pretty good at predicting things. Total surprise with each chapter. So I am sure that was the vaguest book review ever, but honestly you need to read this without me giving away any spoilers. As a caveat though, from the reviews on Goodreads, it seems that this book is either hit or miss with people. Either you love it like I do, or people thought it was too much to keep up with and didn’t carry well between characters. I will let you decide. I think though if you are a fan of Jodi or of elephants, you will like the book. Have you read Leaving Time? 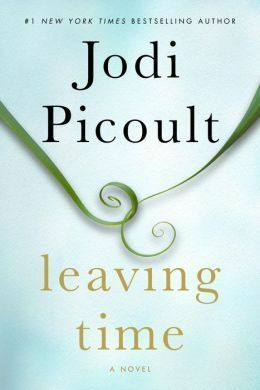 What is your favorite Jodi Picoult book? This entry was posted in Books and tagged books, Jodi Picoult, Leaving Time. Bookmark the permalink. Have you read hebook ‘Th ePact’? I absolutely loved it. That was one the first of Picoult’s I read. It was one that made me fall in love with her writing and connection to emotion. Very intense! I wish I could read it all over again for the first time!My favorite Jodi Picout book is Nineteen Minutes, followed by The Pact. I met her in Philadelphia! I was too chicken to ask why the book version and movie version of My Sisters Keeper were so different! Nineteen Minutes was the first book of hers I read, followed by the Pact then My Sister’s Keeper. All three musts of Picoults. Such great writing. I was pretty pissed though about the movie version of My Sister’s Keeper. I love Jodi Picoult but I haven’t read this one yet. That needs to change!